Fred. Olsen Windcarrier’s jack-up vessel Seafox 5 has officially changed its name to Blue Tern. The Norway-based company emphasized that most of its vessel have a name starting with ‘B’, therefore renaming Seafox 5 was a natural step. Fred. Olsen Windcarrier made an agreement with the Seafox International Group in December last year for the acquisition of a 51% ownership in the jack-up vessel. With the deal, the vessel is under commercial, technical and administrative management as an integral part of the Fred. Olsen Windcarrier fleet of jack-up vessels for offshore wind. 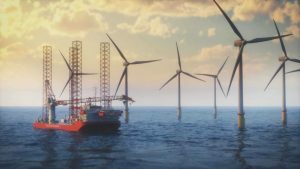 Blue Tern’s first contract includes the Hohe See offshore wind project, where it will work side-by-side with Brave Tern. With an overall length of 151m and a breadth of 50m, the vessel features a 1,200t main crane and can accommodate up to 150 personnel. It is capable of operating in water depths of up to 65m.